The Fogarty Epidemiology Research Training for Public Health Impact Program (Epi-Nigeria) at the Institute of Human Virology, University of Maryland School of Medicine currently offers a distance learning, mentored research training program. This program leads to the acquisition of a Master of Science in Health Sciences (MSHS) with a concentration in Implementation and Dissemination Research Science through the UMB Graduate School. In addition, a PhD in Epidemiology is offered which requires the Fogarty trainee to spend two years in Baltimore before returning home to complete dissertation research. Since it takes an average of 17 years for 14% of research to translate into practice, the importance of Implementation and Dissemination Science is evident. The goal of Epi-Nigeria is to offer Nigerian trainees a quality, online masters degree program in Implementation and Dissemination Science or a PhD in Epidemiology. The program also strives for building capacity to study methods and interventions that will translate into everyday clinical and public health practice for the purpose of improving lives. Below are the course schedules, trainee selection process and course application details. 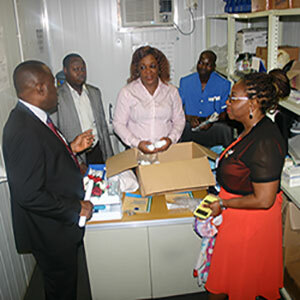 All trainees are selected through the Epi-Nigeria Training Advisory Committee (TAC) made up of Nigerian academic and public health leaders and foremost international HIV/AIDS researchers. The TAC meets in the fall for trainee selection. Criteria for trainee selection are provided under the Application process detailed below. Application deadline for Candidate Application Packets each year is September 15. The complete Candidate Application Packet must be received by Joyce Johnson, Jojohnson@ihv.umaryland.edu on or before September 15.